We are delighted to announce an upcoming paper by Dr. Andrew Piper from McGill. In this talk I will present some of my current collaborative work to create topological models for visualizing literary history. While the term topology covers a variety of fields that extend from graph theory to the mathematics of continuous spaces to thinking about topoi or linguistic “commonplaces,” we are using it as a means of modeling linguistic patterns to understand the spatial connections of literary texts. In bringing to light the distributed recurrences of language that otherwise escape our critical readings, how can topology tell us new things about our literary past? Projects to be discussed include the impact of the eighteenth-century epistolary novel, the meaning of social networks in detective fiction, and the rhetoric of conversion in autobiography and the novel. 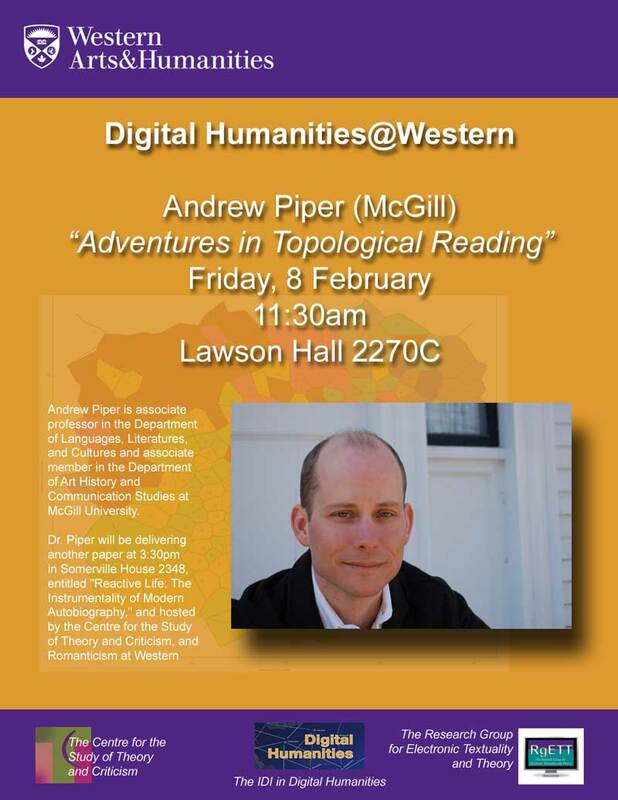 Andrew Piper is associate professor in the Department of Languages, Literatures, and Cultures and associate member in the Department of Art History and Communication Studies at McGill University. His new book, Book Was There: Reading in Electronic Times (Chicago, 2012), is an attempt to map out the possible futures of reading through an understanding of the historical entanglements of books, bodies, and screens. As part of his work on the lineaments between print and digital culture, he is co-founder of the FQRSC-funded research group, Interacting with Print: Cultural Practices of Intermediality, 1700-1900, as well as CiteLab, a new digital humanities initiative at McGill University. In addition to a number of articles that explore the intersections of literature and the book in the eighteenth and nineteenth centuries, he is the author of Dreaming in Books: The Making of the Bibliographic Imagination in the Romantic Age (Chicago, 2009), which was awarded the MLA Prize for a first book. 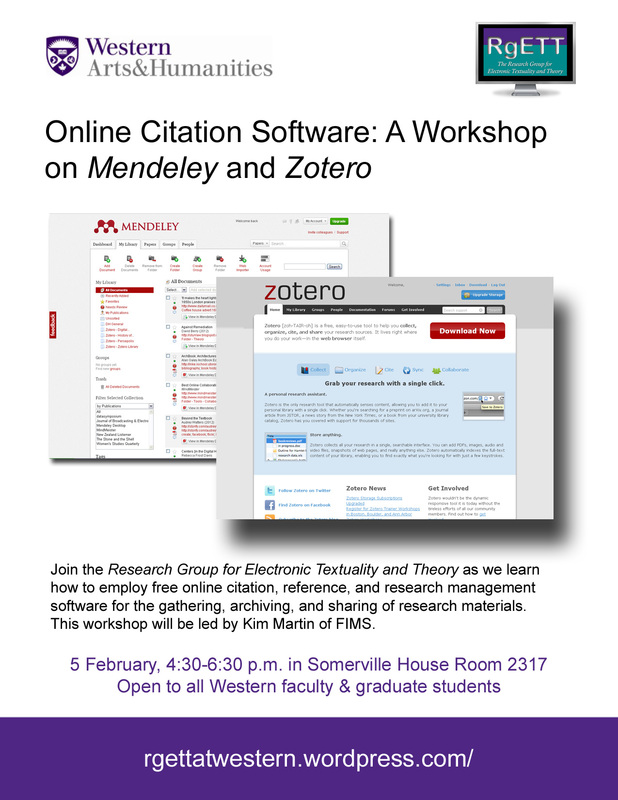 This presentation is co-hosted by the Centre for the Study of Theory and Criticism, The IDI in Digital Humanities, and the Research Group for Electronic and Textuality and Theory. Dr. Piper will also be another giving a talk at Western on this same Friday at 3:30pm, on the subject of “Reactive Life: The Instrumentality of Modern Autobiography,” Somerville House 2348. Many thanks to Tilottama Rajan and Juan Luis Suarez for co-sponsoring this event! 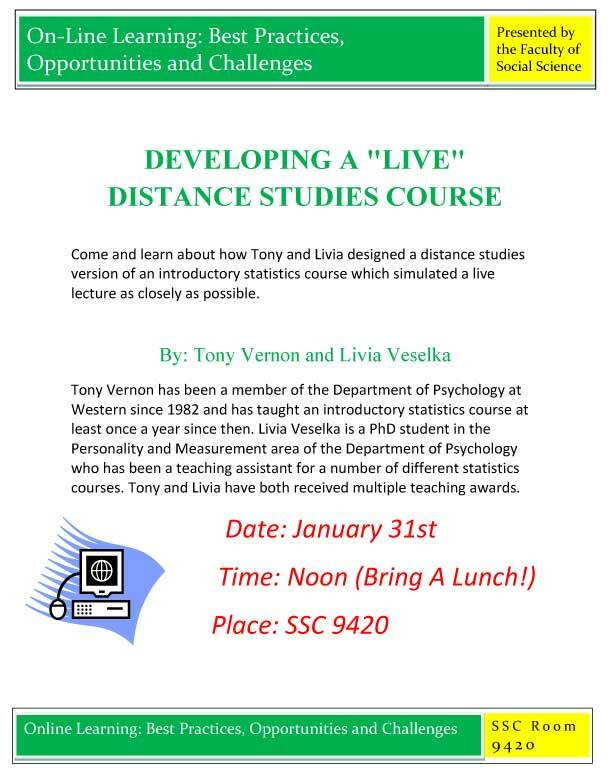 Come and learn about how Tony and Livia designed a distance studies version of an introductory statistics course which simulated a live lecture as closely as possible. Tony Vernon has been a member of the Department of Psychology at Western since 1982 and has taught an introductory statistics course at least once a year since then. Livia Veselka is a PhD student in the Personality and Measurement area of the Department of Psychology who has been a teaching assistant for a number of different statistics courses. Tony and Livia have both received multiple teaching awards. Glen Worthey is Digital Humanities Librarian in the Stanford University Libraries, and head of the Libraries’ Digital Initiatives Group. 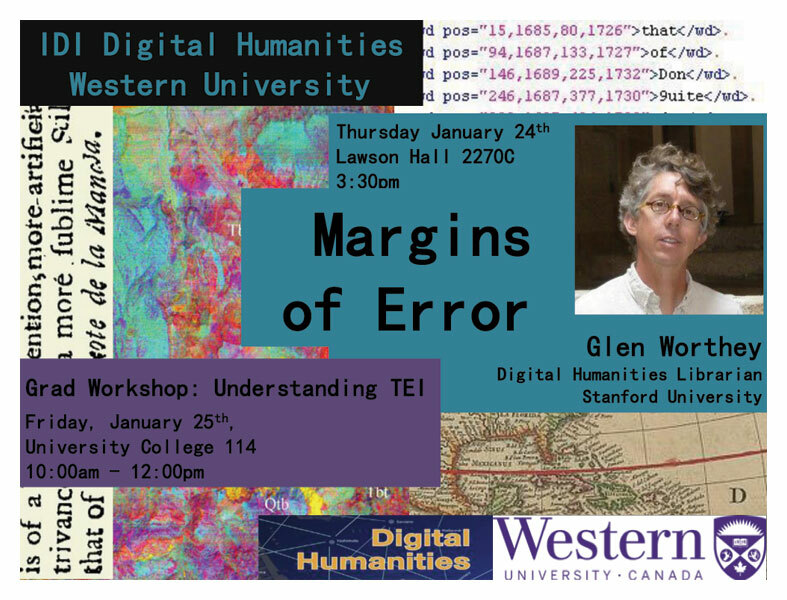 Glen has been active in the digital humanities since about 1995, was a co-host of the international “Digital Humanities 2011″ conference at Stanford. He’s currently a member of the Executive Board of the Association for Computers and the Humanities (ACH), the Steering Committee for the Alliance of Digital Humanities Organizations (ADHO), and the Board of Directors of the Text Encoding Initiative Consortium (TEI-C). Taking DH Off Campus Night Returns! 16 January, 2013. 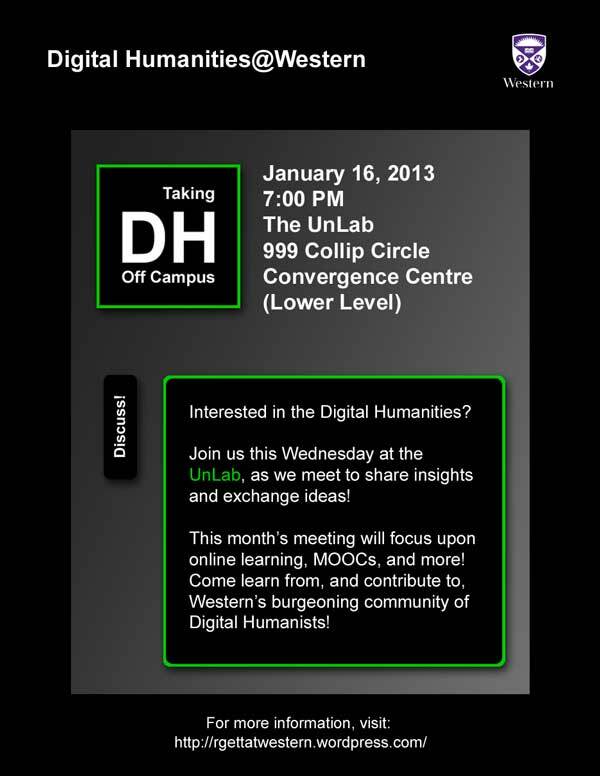 Come join us on Wednesday, 16 January, 2013, for the first Taking DH Off Campus meeting of the new year! We’ll be meeting once at the UnLab, 999 Collip Circle in the Convergence Centre, just north of Western University’s campus. We’ll be meeting shortly after the Faculty of Information and Media Studies’ panel discussion on “Digital Boon or Digital Gloom? The Virtual Future of Higher Education,” and our discussion will commence with a continuation on the theme of online learning. 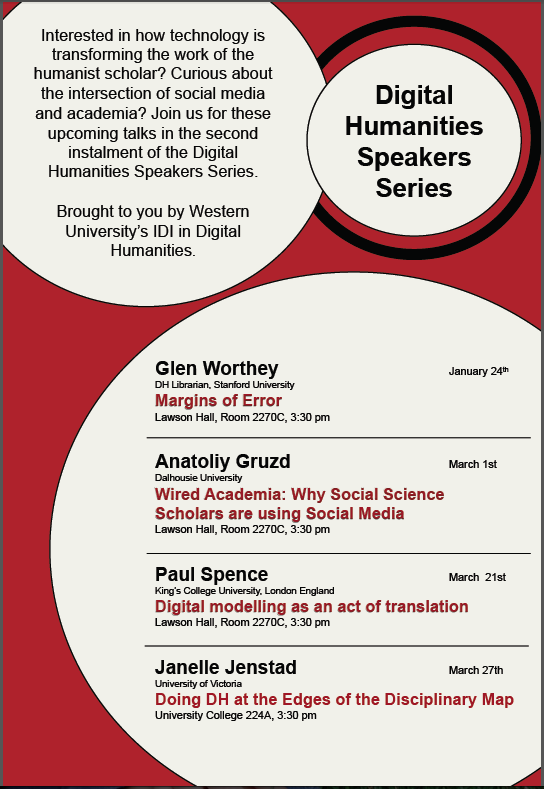 Attendance at the FIMS event is not, however, necessary for those attending this meeting, and discussion will be, as always, open to a variety of subjects relating to the Digital Humanities. 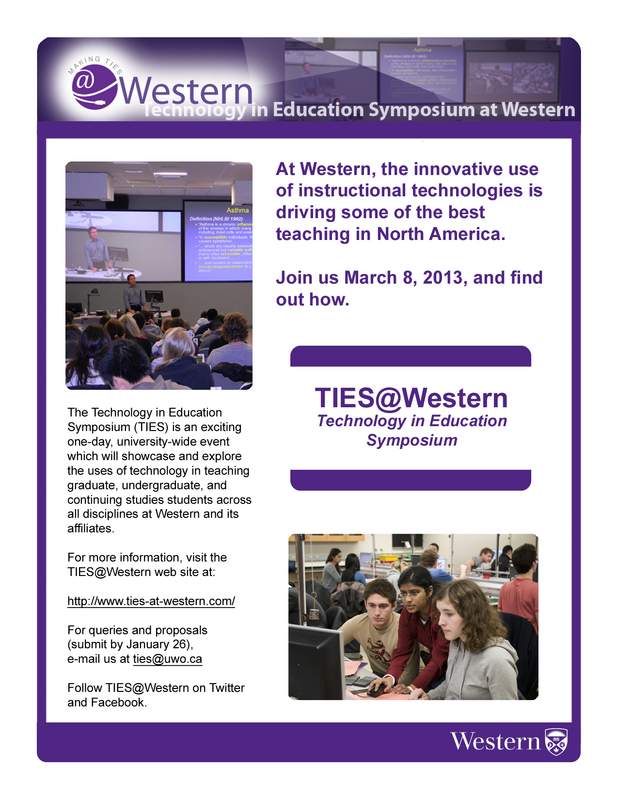 Come be a part of this informal discussion group on all things related to technology and the Humanities!